I receive questions here and there about my nail and cuticle care, favorite top coat, etc. So I thought I would create this post and also stick it in one of my "pages" on my side-bar so it's easily accessible in the future. Prior to about one year ago, I would have never thought anyone would ask me how I take care of my nails and cuticles. I had a horrible habit for at least 15 years of picking my cuticles. They were so bad that I would always hide my fingers - my hands were always in fists. I tried quitting so many times. I tried putting band-aids on every finger, used bad tasting serums, wore a bracelet as a reminder, told my husband to pinch me if he saw me picking, etc. Nothing ever worked until I started reading nail blogs. While reading blogs, I started seeing Chanel Peridot swatches and fell in love. I made a deal with myself that if I would quit picking my cuticles for 30 days, I could reward myself with a bottle of Chanel Peridot. And it worked! I became very aware of what I was doing with hands from that point forward and stopped myself whenever I would want to pick. I still have scars on my thumbs from how far down my skin was damaged. I'm so glad I overcame that habit because if I hadn't, I wouldn't have this blog. My favorite nail polish remover is Zoya Remove+. I have always used the cheap remover from Target and I would scrub and scrub to get my polish off. I finally decided to splurge and try Zoya Remove+...partly because of the cool plunger cap. It's so convenient and you get the perfect amount of product without spilling. Zoya Remove+ generally takes off all of my nail polish with 2 cotton rounds. Glitter and some metallics may take a little more, but it is the best remover I have ever used. It also doesn't dry out cuticles because it has a 3 in 1 formula that moisturizes, nourishes, and fortifies. It is called a remover, nail prep, and nail conditioner and you aren't suppose to wash it off before you paint your nails. I started out with the small bottle with the flipper for $9.99. Now I buy the 32 oz jug for $25 and use it to refill the small one. It lasts quite a while and I usually buy a new one if they have a free shipping deal or a promotion where I can get a free polish with a $25 purchase. 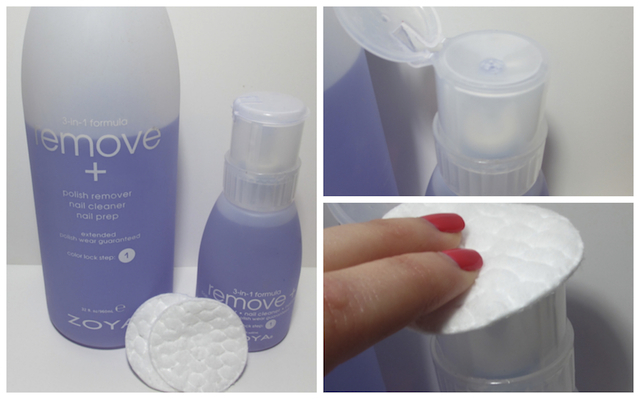 I highly recommend this remover. OPI Nail Envy is a great Nail Strengthener. 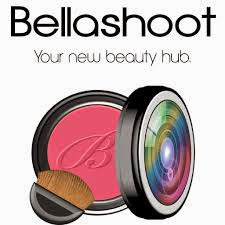 I have tried many strengtheners from Sally Beauty Supply and Ulta, but this seems to do the trick for me. My nails no longer peel and they are pretty strong - I can't bend them like I have been able to do in the past. I usually put this on after I take my polish off if I don't plan on painting them right away. I probably put it on about 3 or 4 times a week. Lush Lemony Flutter is what saved my cuticles. I always struggle with dry cuticles, especially in the cold Minnesota winters. I am happy to say that I think I finally have them under control. You may notice in some of my photos that my cuticles are a little long - they probably come a little further out on the nail than most people prefer. But because of my past with picking and failed attempts at pushing them back or using cuticle removers, I just leave them alone. Because I leave a small gap between my cuticle and where the paint starts, it can sometimes look like I have a bigger gap than I should (I recently found this out through the comments under a photo that Zoya shared on their FB). But this is how I paint my nails and I guess I can't please everyone, right? 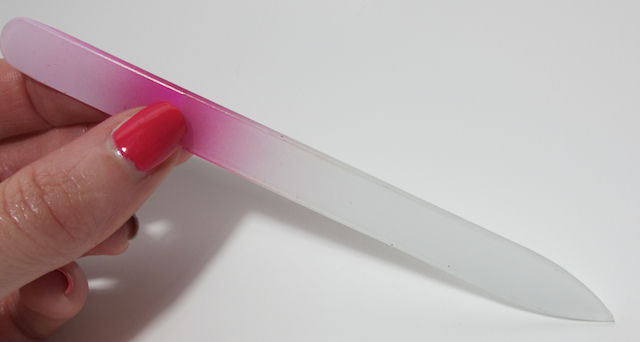 I use a glass nail file to file my nails. I like it because I got sick of repurchasing the regular files - I would always buy that 4-sided one from Target or Walgreens and it would wear out within a month. The glass file takes a little bit to get used to because it takes more of the nail with each swipe. It was also a little tricky getting the right angle without making it feel like nails on a chalkboard....eeek! I don't file my nails very often, but when I do, I have been liking the glass file. My favorite top coat is Revlon Colorstay Gel-Shine. I have always used either Seche Vite or Essie Good To Go, but I couldn't stand how thick and goopy they got when I got half-way through the bottle. It was such a waste of product and money. I tried so many top coats; looking for the shine, quick dry time, while keeping the thin consistency. Revlon Colorstay fits the bill...it's thin enough for easy application and quick dry time, but thick enough to give you lots of shine. I also love the wide brush. The price is awesome too - especially if the drugstore is having a sale. If you are in the market for a new top coat, I highly recommend Revlon Colorstay. The last thing I will recommend is drinking plenty of water and taking vitamins. 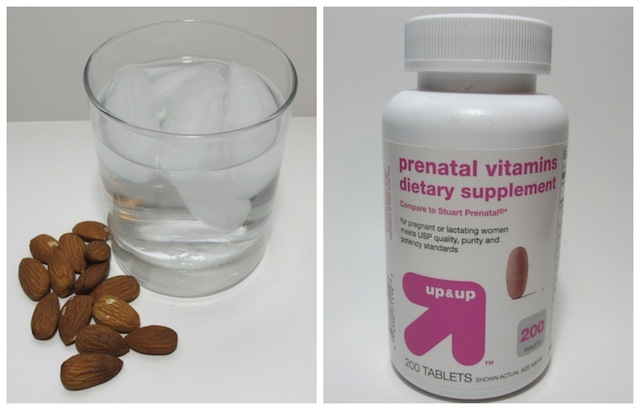 I take prenatal vitamins; not because I plan on getting pregnant any time soon, but because I have heard/read that it is good for the hair and nails. I have also read that Almonds are great for hair, skin, and nails. so I have a handful of raw almonds every day. I hope this helped you in some way. Like I said, I'm not an expert and this is just what works for me. I don't think nail and cuticle care is a one size fits all regimen. Good luck! What are your favorite nail and cuticle products? This is such an amazing post. I just got the Zoya Remove+ when I got my Earth Day Exchange polishes and I LOVE it. I especially love how the smell isn't completely overpowering [not that I try to smell it, but obviously you are going to somewhat]. It was great for removing polish. And my nails looked so pretty afterwards. I'm going to have to check out a bunch of this other stuff. I've been looking for a really good top coat with no real luck. The same for a nail strengthener. I'm pretty tough on my hands and need something that withstands my abuse! Yes, I forgot to mention the scent of the remover. Good point! Yes, try the top coat and let me know what you think. I highly recommend the Lemony Flutter. You won't regret it:) Thanks for reading my very long post! I've tried thinning it out too but it still isn't great...maybe I didn't use enough. I have that Burts Bees cuticle stuff at work too and like it. I've had my eye on the Hand Food, I do want to try that. Thanks! Fun to read! Yay for Lemony Flutter ♥. Oops, I too have a problem picking my cuticles...I admire your strength to quit! I don't think I'll be quitting any time soon....hahah. It was very hard to quit. I failed so many times...and it was a Chanel polish that finally made me quit:) And now my blog keeps me from it! Great post! It's always interesting to see how other people care for their nails, and I'm particularly interested in what you do because you have such beautiful nails! I really struggle with dry peeling cuticles and peeling nails in the cooler, dry weather. I might have to try OPI Nail Envy, and Lemony Flutter looks like something I need! Great post =) Very thorough! I myself didn't pick my cuticles when i was younger but bit my nails for longs years. I stopped it with 16 and it was really hard for me. Today (nearly 14 years later ^^) i'm really proud of my nails. But i sometimes pick my cuticles now :/ and i don't find a good way to push them back and like it. I tried several technics, and i don't know, they always look like crab afterwards, or i have to cut them *shiver*. Or they look good once, and next time again like crab. I really like that you just let your cuticles alone. And i think they look pretty nice :) This encourages me to just try this way as well. Thank you for beeing an inspiration for me! I bit my nails too when I was younger. I'm surprised I don't do any of it anymore, they are hard habits to break. Yes, maybe try leaving your cuticles alone and see what happens. Sometimes at the end of a long shower, I will push them back a little tiny bit...but not much because I'm so scared. I have never had good luck messing with them. And you speak great English...whatever language you speak normally, I HIGHLY doubt I could type a comment like this! Awesome post! It's fun to read what your routine consists of :) Lemony Flutter is amazing, it made all the difference for my cutes, too (but I think you know that, lol). How did I miss Zoya featuring one of your manis? I tell you, I never see half the stuff I'm subscribed to. Silly fb. Also, I love the idea of using a pedi creme for hands. Your skin always looks amazing in your photos, now I know part of why :) My own skin and skintone have become my biggest peeves in my photos... My hands are always so blotchy. I may have to order some of that Julep creme. I know, I love reading the routines of others too...that's how I found out about some of the things I use:) You have to find the recipe that works for you and your nails. I just read a cuticle care post on Chalkboard Nails, and she uses Burts Bees Lemon Butter Cuticle Creme, which I would think is very similar? It should be readily available at places like Wal-Mart, Target, and drugstore chains, probably. Wal-Mart has a .6 oz tin for $5.97, which seems reasonable to me? I might try this one. Sorry Es, I don't mean to link drop (plz don't hate me! ), but this kit includes the LBCC & looks to be a GREAT deal! I forgot to mention in my post that I actually have that at work. It's okay, it's not the same at all. But I use it:) Thanks for thinking of me! I am chuckling about that Pedi Creme. I may have to try it, if I can get my hands on it! I am searching for a good product to put on my cuticles before photos, and it sounds like that works so well for you! Nail blogs saved me from my nail-biting self too! I never imagined I would be taking photos of my nails- they used to be bitten past the quick, and as a result my nail beds are pretty short these days, but I am so glad I finally stopped doing that. Yay for pretty colors as motivation! I bit mine too when I was younger. Then I swapped that habit for picking.... if someone would have told me I would be taking pictures of my fingers/nails and slapping them on the internet, I would have thought they were crazy. Yes, try the Pedi Creme before photos if you can get your hands on some. I understand why you use the pedi cream on your hands, but do you realize there is urine in it? That is what UREA is. Thanks for bringing this subject to my attention. I just did some research and not only is UREA found in urine, but it is also created in a lab and that synthetic material is used for moisturizers and lots of other things. So there isn't urine in my Pedi Creme - the lab created UREA is:) Thanks for posting this comment though, it was interesting doing research on it. Yep, you sound like how I was. They were always bleeding and I always hid my fingers from everyone:( I would do it when I was driving, talking to someone, nervous, bored, etc. I wanted to start wearing gloves every day. But once you get out of the habit, you will be done for good... I hope you get it figured out. If you love the zoya remover you have to try the cutex instant revival (its green). It reminded me so much of the zoya+ in how it doesn't dry your cuticles but smells better than zoyas. So I looked at the ingredient list and its the exact same as zoyas just died green instead of purple and its 2 bucks not 10. I was a total zoya remover snob for years and I love the cutex one more. You should just try it. I promise its worth it. Really? Ok, when I am done with my jug of the Zoya, I shall try the Cutex one. Thanks! I LOVE this article! I have Systemic Lupus and Fibromyalgia, so I battle constant dehydration with my medication, and just generally don't like the taste of plain water, anyway, so I know what battle you went through with the ragged cuticles. My tendency is to forget to protect the cuticle before I do the manicure, and then I'm picking polish off around the nail bed for the next three days. But now that I'm back in University pursuing double doctorates in Astrophysics and Applied Mathematics, and battling these diseases, I'm also back to battling beautiful nails. There are two places we notoriously forget to protect with sunscreen: Our necks, and hands. So I'm just now beginning to see tiny hints of where my hands look older than they once did. I LOVED the Satin Hands by Mary Kay (I was a consultant, and loved this simple and original kit that contained a travel size of their wonderful hand creme; a travel tube of one of the facial masks [or done with table sugar initially when it was being developed], but of course cannot use it any longer since I'm a 'po college student again), and am on the quest for the perfect cuticle cremes and nail bed products. I did finally find a hand lotion worth its weight in gold that acts like the Satin Hands once did by flattening out every line on your hands: La Source Hand Therapy by Crabtree & Evelyn (pronounced EE-va-lin, not Ev-a-lin). 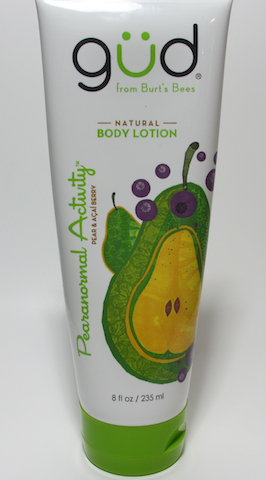 The difference with this lotion is that its primary ingredients are glycerine and silicone, not lanolin like so many others, so it works into/onto the skin without feeling greasy, but while keeping your skin taut. And ERMAHGUUD, the smell! I HAVE to buy what smells good on me or I won't enjoy using it. It's why I used RUSK Marine Bio-Therapy Seaweed and Kelp shampoo and conditioner (smelled just like the beach and if you didn't wash for 3 or 4 days, your hair STILL smelled like the bottle); used Renergie Anti-Firming and Wrinkle Creme by Lancome for my face creme (just the smell of this product makes me feel so incredibly beautiful and feminine when I know I'm not); good old Rainbath and Sesame Body Oil by Neutrogena, and my body scrub: Warm Spirit Mango Body Butter Sugar Scrub. Again, just something intensely stimulating, motivating and relaxing at the same time. Oh, and I remember trying a gel polish back in May of last year. It was the Revlon brand you named and a beautiful eggplant creme I'd been looking all over for. But I noticed after wearing it for only 2 weeks, my nails had become soft and brittle, almost translucent. I didn't put it together, and so another manicure a week later and more breaking still didn't clue me in. Finally, after 2 months of watching the condition of my nails go downhill, I stopped using the product and slowly began to rebuild them. But it took me about six months of babying them; doing extra-special manicures and no gel polish to get them back to where they are strong and growing again. I'm not sure how just a top coat would affect them, but I'm a bit scared to find out. I still haven't found a good cuticle remover/creme. One I'm currently trying is called O'Keefe's for Healthy Feet (or insert Hands; they have one for that, too, but figured if I could tackle the toughest skin and be successful, it will probably work on my tough cuticles, too). It was $10.95 at our locally-owned drug store for a 2.7-oz. tub. The consistency is hard to describe. It's definitely a creme rather a lot like the Noxema you may have used for basic skin care growing up like I did. Pressed into the bottle into a hard ball/mound that would break into smaller pieces as you ran your fingers over it. This is like that. I'm also definitely NOT a fan of the odourless. But, it says to use after showering and mostly at night when the reparative work is done, so tonight I will slather up both feet and hands/cuticles and cover with heavy socks and gloves and see how we do in the morning, although I've been reading the reviews for the product after being taken to that level of commitment, and they are rave and fabulous! Working in such a highly-organised and productive company such as MK for years helped to shape a lot of what I believe about beauty and beauty products (if you ever saw her photo, you would never believe she was 83 when she died, but truly looked no more than 55--Srsly! ), and one idea I am intensely loyal to is the idea that switching product lines isn't *usually* the best route for your nails/body/skin/hair (although a most necessary one when that company's line doesn't carry the rest of your products). A company will produce products not to get you to purchase everything from only them (although I'm sure that's a factor--Apple and Mac became VERY comfortable with the idea of the proprietary component), but they want you to use everything from their lines because the base ingredients and chemicals are ALL alike/similar. This is only for the benefit of the consumer. I've read/seen horror stories of women who hopped from line to line just like we all do: finding the perfect hair spray here, the greatest shampoo there, the softest conditioner "over yonder", and instead of gaining immediate benefits, a large percentage will end up with damaged/dry/brittle/broken hair, with severe build-up and possible scalp damage. We ended up with a dangerous combination of chemicals. And sometimes it's so subtle we don't notice the cause, until it's too late. So the next time a beauty rep asks you to consider purchasing the entire line from only her, give her a little more attention and time than you did previously. You might not be able to see her "real" motive beneath the Prada spring line suit, MAC full make-up, and the two-hundred-eighty-dollar-per-ounce Michael Kors Sporty Citrus parfum, but trust me, she's on your side.